Last month, with the help of a tie-breaker vote, Education Secretary Betsy DeVos squeaked through one of the most humiliating confirmations ever for a cabinet official. In the weeks leading up to the vote, millions of Americans deluged congressional phone lines with calls and faxes urging their elected representatives not to confirm DeVos. GOP leaders may have pushed through this disgraceful nomination, but they unleashed a tsunami of citizen activism that won’t let up when it comes to the fight for our public schools. In Philadelphia, we have learned a thing or two about beating back a top-down, anti-public school agenda. From our experiences, we’ve learned how to build a movement that will not only hold accountable people like Betsy DeVos but will also lift up a vision of vibrant public schools and restore them to the center of our civic life. In 2002, the state of Pennsylvania took over Philadelphia’s public schools, stripping away local control, massively expanding charters, and starving existing public schools of funding and resources. 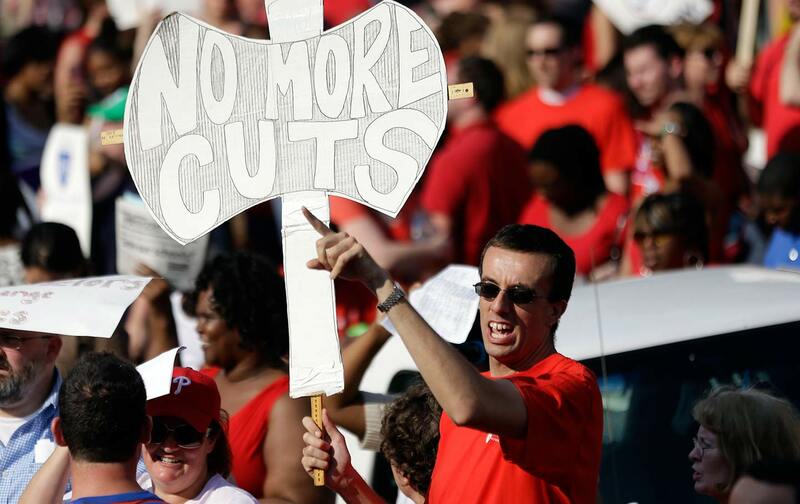 Then, in 2013, thanks to a GOP-led state austerity budget that cut almost a billion dollars from public education, Philadelphia’s state-controlled school system closed down 24 public schools and lost thousands of school staff in the name of cost savings, then expanded thousands of new charter spots at nearly the same cost. In response, Philadelphians took to the streets and organized. Parents, educators, students, and community members built coalitions among labor, clergy, business, and civic organizations. We fought against an agenda of disinvestment, consolidation, and neglect, and instead pressed forward with a commitment to establishing a baseline level of staffing and resources for every school. Parents forged a legal strategy for ensuring adequate programs and a quality curriculum. After the massive budget cuts hit, parents filed more than 800 complaints with the state’s Department of Education about overcrowding and curriculum deficiencies and then won a court order, effectively forcing the state to investigate the problems and fix any violations of state code. Meanwhile, years of organizing efforts by high-school students made strides towards ending zero-tolerance policies and improving school climate. A long-sought change in the student code of conduct in 2012 limited the use of suspensions and was accompanied by new, district-wide efforts to implement restorative practices. More recently, new district policies further restricted the use of suspensions with young children in response to dress-code violations. Faced with continued austerity, we marched, took over school-board meetings, and lobbied City Council offices. And we started to win more victories: City officials began to acknowledge they could do more and boosted their financial support for the struggling school system. We drew on our networks to find allies in other communities across the state suffering from similar circumstances. This is the coalition that helped throw out a one-term GOP governor in 2014 and installed Tom Wolf, a governor who centered his campaign on fair and equitable education funding. And this is the coalition that the following year elected Jim Kenney, a pro–public education mayor, and boosted me, a mother of three kids and longtime education activist, into a seat on Philadelphia’s City Council. We’ve already shifted the narrative in our city away from austerity and back to real investments that restore essential services to our schools. With a more unified political leadership, and with the help of boosts in state and local funding, we’re putting hundreds of nurses and counselors back into school buildings that had been stripped of these vital personnel. We’re also protecting immigrant students, ensuring water access and safety, expanding the teaching force, and re-embracing in-district models of improving schools rather than outsourcing interventions to unreliable education-management organizations. In 2016, we passed the nation’s first big-city sugary-drink tax on beverage distributors to expand funding for early education. And we have mounted new legal challenges to the profoundly inequitable system for funding public schools in Pennsylvania and won a legislative commitment to base state funding on student need. As we prepare to face the DeVos agenda, we will continue to reject narratives of public education rooted in failure and disinvestment, along with the peddling of long-debunked theories about market-driven reform that have been deployed in cities across the country. The strength of our resistance is local—and vast. It starts with the millions of us from Pennsylvania to Nebraska to California, and every state in between—who called, faxed, visited, and tweeted at our senators to vote against an astonishingly bad nomination. We rose up in unison to defend this democratic ideal of public education. If the Philadelphia experience is any measure, this uprising won’t just be limited to our schools. It will form the basis of a movement which will not only withstand an authoritarian federal agenda but will also grow more unified in spite of it. And while the challenges remain large, we’ve shown that the march of privatization and vouchers is far from inevitable, and that we the people still have the power to imagine and work toward a far better world.